Speculative Faith | The Lesser of Two Evils? Evil cannot defeat evil; it can only replace it. I’ve pretty much sworn off seeing comic book movies in theaters anymore (though I will rent them on DVD). However, my wife uncharacteristically insisted that we go see the new Venom movie, her sole reason being that it was a box office hit in her home country of China and she was curious to see what all the hubbub was about. I was hesitant at first because the reviews were hardly stellar, but I’m a big Tom Hardy fan so I decided to give it a shot. Overall, I’m glad I did. Tom Hardy’s performance was very entertaining, and I found it refreshing that his character wasn’t the typical bullied-in-school-and-then-gets-a-superpower-and-becomes-awesome trope. The movie isn’t anything spectacular but it made for a fun afternoon. Below are some minor spoilers so if you haven’t yet seen Venom and plan to soon, please read no further. Venom did a great job of making a villainous character as sympathetic as possible while making it crystal clear that it is still a villain. In most superhero films, the central character has a mission – a disaster to avert or a bad guy to defeat. In Venom, Tom Hardy spends most of his time trying to work out an equilibrium with the monstrous entity that has taken over his body. Destruction ensues, good guys get killed, heads get bitten off, and Tom Hardy wants nothing more than to be rid of this “parasite” as he calls it. He doesn’t go crazy or become drunk with power and “cross over to the Dark Side.” He tries to convince Venom to tread as lightly as possible, with mixed results. Only in the last half hour does another adversary show up, a stronger alien called Riot (these creatures must get their names from punk rock bands). Riot wants to bring back a horde of hungry critters and consume the Earth, while Venom, who is admittedly a “loser” on its home planet, realizes that it can be a big shot on our planet, but that means that the human race must survive in order for it to be at the top of food chain. Thus, Venom’s and Riot’s interests clash and the battle for the human race ensues, though the motives for each side are dubious. I’m reminded of a quote from The Chronicles of Riddick, spoken by Dame Judy Dench’s character: “In normal times, evil would be fought with good. But in times like these, well, it should be fought by another kind of evil.” Hollywood likes pitting two evils against each other, and the “good guy” is the one with the quantifiably less evil motives. 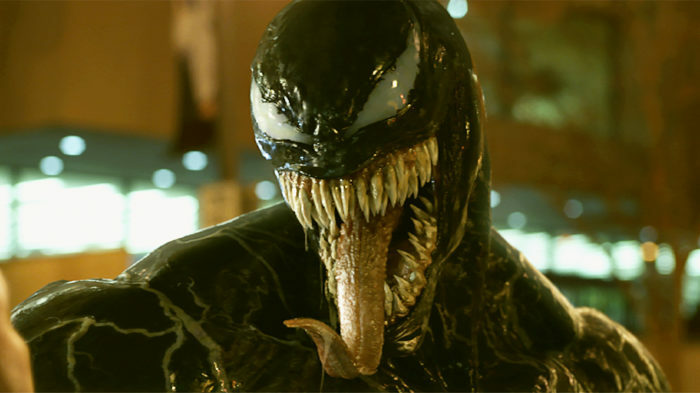 In the case of Venom and Riot, Venom just wants to eat people here and there (and only “bad guys” as Tom Hardy insists at the end of the film) while Riot wants to eat everyone. Thus, we are supposed to cheer for Venom. The lesser of two evils is the hero and the greater is the villain, because every conflict has to have a hero and a villain. Does this notion translate into real life? Occasionally, though with hardly the same dramatic flair. During World War II, the New York Mafia took control of the ports in the interest of “national security,” though this arrangement greatly increased their illicit profits. Was national security protected? Perhaps, though it would hard to argue that the Mafia’s involvement was a good thing. There are numerous examples in history when an oppressed people or country turned to an outlaw tyrant to save them from their current tyrant, and things just go from bad to worse. That’s the thing about evil: it’s always evil. And evil is ultimately selfish, hateful, and cruel. Evil cannot defeat evil; it can only replace it. Rom. 12:21 tells us to overcome evil with good. Nowhere in Scripture does evil supplant evil with good results. When confronted with a great evil, we should not cheer for another opposing yet still evil force, even if the promised results sound appealing. We should know that in the end, Venom is still the villain. Thank you. Only good can overpower evil. Very true. That’s why we Christians must pursue personal holiness or it will just be evil vs evil. Without our saltiness we are nothing. One area where people fall short is presenting an alternative to things they don’t want to happen. Authors can’t always express alternatives in stories, but as it is now, alternatives aren’t being expressed often enough. 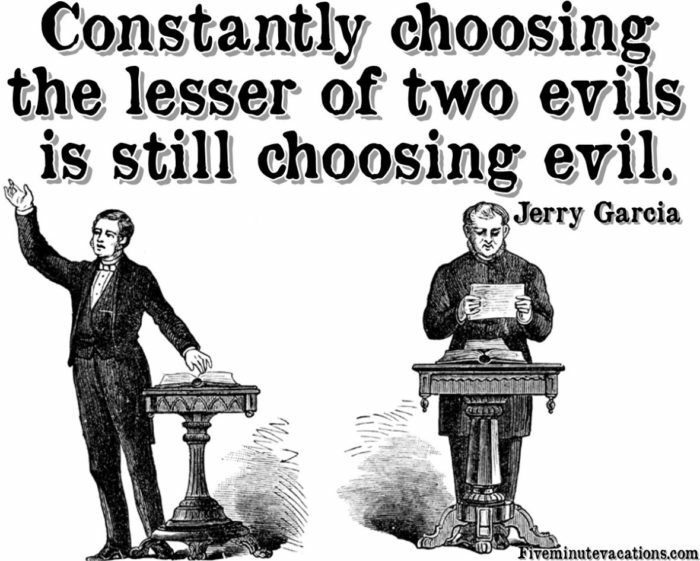 In the case of not picking the lesser of two evils, show alternatives that aren’t evil. And I don’t mean just throwing something convenient in there without thinking about the negative repurcussions that solution can bring, I’m talking about a realistic alternative that feels like it could work and actually be reached in that scenario. With Venom…I haven’t seen this movie, so I don’t know what the char tried or didn’t try, but one aspect could be a matter of what behavior the char considers ‘ok’ for Venom. The main char sounds like he was struggling very hard to control Venom in the first place, so getting Venom to ‘only eat bad people’ is definitely a lot of progress in the right direction. The primary problem would be if the char stopped there. The story could instead show the char plotting how to make the situation with Venom even better, and hoping that Venom could be taught compassion for human life so that he doesn’t kill anyone unless necessary. This shouldn’t be done in a preachy way, but in a way that shows the char realistically working through the problem. Another place I’ve seen this issue was in the movie What Happened To Monday? The story deals with issues like overpopulation, and denounced the way the government controlled it, but didn’t really have the chars think enough about solutions, and instead subtly had this thing where they showed the protagonists as superior to the antagonist. In a lot of ways, they were, but the lack of solutions presented in the movie risks undermining its point. I give the full disclaimer that I haven’t seen the film yet and am only going on spoilers and other news of upcoming stuff. But I do believe I read that Sony(?) (or whoever has the rights) wants to do a whole spate of movies set in the universe Venom introduces. They want to borrow Spider-Man and merge it (or at least have the current Spider-Man there) with the MCU, but if not, it’s a Spider-Man verse without Spider-Man. So there might be more films. We might over time get the symbiote getting more morally good just as the Scarab does with Jaimie over in DC and like Lasciel’s shadow did with Harry Dresden in the Dresden Files. I haven’t seen Venom, so I can’t make a call on it. But the failure to provide a good third option in ‘lesser-of-two-evils’ scenarios can lead to either valorizing apathy or deus ex machina. THANK YOU. Evil is always evil. End of story.